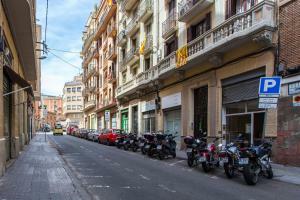 Set 800 metres from Magic Fountain of Montjuic and 1.5 km from Montjuïc in Barcelona, Key Vintage Poble Sec Apartment offers accommodation with a kitchen. Guests benefit from a balcony and a terrace. The apartment is equipped with a TV, 3 bedrooms and a living room. Featuring air conditioning, the accommodation also comes with 1 bathroom with a shower. 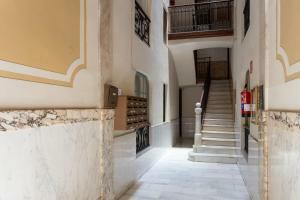 Palau Sant Jordi is 2.5 km from the apartment, while Boqueria Market is 2.5 km from the property. The nearest airport is Barcelona El Prat Airport, 14 km from the property. Please note that check-in from 20:00 to 00:00 has a € 30 extra cost. Please note that check-in from 00:00 to 01:00 has a € 50 extra cost. Please note that check-in from 01:00 to 02:00 has a € 60 extra cost. Please note that check-in after 02:00 has a € 70 extra cost. Please note that late check-out after 17:00 is available on request at an extra cost of € 30. A € 30 supplement will be charged for check-ins on public holidays, such as Christmas Day and New Year's Day. A security deposit of € 300 is required upon arrival for incidental charges. This deposit is fully refundable upon check-out and subject to a damage inspection of the accommodation. This apartment features a kitchenware, washing machine and toaster. Rate: € 60.02 ... € 141.20; select dates below to get current rates.